New University of Houston President Renu Khator(right) chats with Cyvia and Melvyn Wolff. 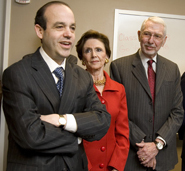 On the morning of her first day as University of Houston president and chancellor, Renu Khator thanked Melvyn and Cyvia Wolff, longtime UH supporters, for a generous donation that will boost the entrepreneurship program at Bauer under the new banner of the Cyvia and Melvyn Wolff Center for Entrepreneurship. Bauer celebrated the Wolffs and President Khator with special festivities on January 15. Making the announcement in a crowded classroom that included the class of 2009 Entrepreneurship students and numerous UH boosters, including former UH regents Michael Cemo and Morrie Abramson along with UH System Board of Regents Chair Welcome Wilson, President Khator congratulated the Wolffs for a gift that will allow continued growth and expansion of the top-rated program. 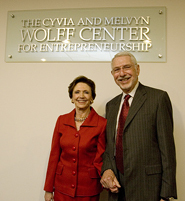 Cyvia and Melvyn Wolff celebrate the naming of the Cyvia and Melvyn Wolff Center for Entrepreneurship. “This is all about synergy, and it’s synergy we are here to celebrate today,” Khator said. She praised the couple for their seminal role in helping to make a big vision become reality, bringing together outstanding students who are ready to learn, committed faculty and staff, and involved alumni and donors. “We are celebrating their generosity because they have become the glue,” President Khator said. Melvyn Wolff, chairman of Star Furniture, graduated with a BBA from Bauer in 1953. He is chairman of the UH College of Business Foundation and serves on the Dean’s Executive Board. Wolff led his family business through a transformation that ultimately resulted in the business’ sale to renowned investor Warren Buffett, who made Star part of the Berkshire Hathaway portfolio. Wolff and his sister took Star from the brink of collapse decades ago and grew it into one of the top 100 furniture stores in North America culminating with the sale to Buffett. Wolff’s success embodies the resilient spirit found in the nation’s most successful entrepreneurs. He encouraged those in the audience to return to Bauer in order to give back, once they’ve found success using the skills learned in the program. “We feel really good about the opportunity we’re given to help make a difference in the lives of some of the students,” he said. Dean Warga lauded the Wolffs for the difference they have made at Bauer and in his tenure as dean. “When my family and I came to Houston, Cyvia and Melvyn helped us become a part of the community. It was really apparent how much UH and the business college meant to them.” Under Dean Warga’s tenure Bauer has achieved unprecedented success across all areas. Dean Warga gave the Wolffs credit for helping him succeed. The Wolff Center for Entrepreneurship, formerly the Center for Entrepreneurship & Innovation, was ranked 2nd in the nation in 2007 byEntrepreneur magazine and the Princeton Review.